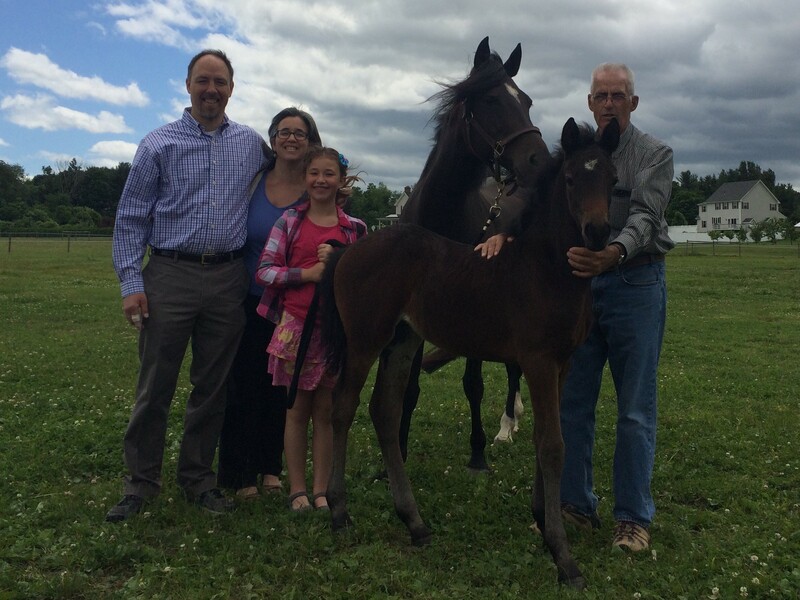 Hadley, MA – June 13, 2016 – UMass Hadley farm announces its newest arrival, “Bay State Legacy”, a Morgan filly named in memory of alumni and long-time supporter Susan B. Roberts, who passed away unexpectedly last year. Bay State Legacy and her mother Bay State Distinction can trace their bloodlines all the way back to those original cavalry horses including US Panez and broodmare Optic, carrying on the government tradition. Using donations from the Susan B. Roberts memorial fund, the university bred Distinction to USEF Horse of the Year “GKB Coal Magic” owned by Dr. The UMass Equine program is part of the Stockbridge School of Agriculture at the University of Massachusetts Amherst. Students can earn their A.S. degree in Equine Management and the school is proposing a new B.S. degree in Sustainable Equine Industries. For more information about the UMass Equine program or Bay State Morgan horses, please contact Dr. Cassandra Uricchio at curicchio@umass.edu or 413-345-0183. Photo 1 caption: Susan Robert’s family pictured with Bay State Legacy at the UMass Hadley Farm; (left to right) son Patrick Cobbs, daughter-in-law Jodi Bornstein, granddaughter Audrey, husband Barry Roberts.